Henri Coanda should be known in history as the Farther of the Jet Engine his design (which he made himself) was thirty years before Whittle, yet all the world believes Frank Whittle invented this form of propulsion. The Coanda-1910 was amazingly ahead of it's time, with steel construction used in the wings, mobile surfaces placed ahead of the wings leading edges to increase lift, all fuel and lubricants placed in the upper wing and above all the engine. His engine the "Air-Reactive Engine", comprised of a four cylinder, 50 hp, water cooled Clerget piston engine connected to a gearbox, then to a compressor which rotated at 4,000 rpm. In front of the compressor a device much like the iris of a camera (called by Henri Coanda a obturator) controlled the amount of air entering the compressor. The air went from the compressor to "Burning Rooms" (combustion-chambers of a ring like section which were fitted ether side of the fuselage) were the exhaust from the piston engine and fuel were added and ignited, the resulting very hot and expanding exhaust exited through tubes and down the steel-sheeted sides of the aeroplane producing the thrust. The aeroplane was on display in October 1910 at the Second International Aeronautical Exhibition at the Grand Palais in Paris were it caused a great deal of interest and crowds as no one had seen any thing like it before (nor would they for another thirty years!). 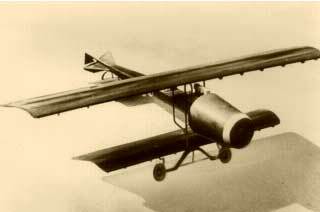 After the Exhibition closed on the 10th of December 1910, Henri Coanda moved his aeroplane to Issy-Les-Moulineaux, were he intended to test the engine, the results of which are best told by Henri Coanda himself. "It was on 16 December 1910. I had no intention of flying on that day. My plan was to check the operation of the engine on the ground but the heat of the jet blast coming back at me was greater than I expected and I was worried in case I set the aeroplane on fire. For this reason I concentrated on adjusting the jet and did not realize that the aircraft was rapidly gaining speed. Then I looked up and saw the walls of Paris approaching rapidly. There was no time to stop or turn round and I decided to try and fly instead. Unfortunately I had no experience of flying and was not used to the controls of the aeroplane. The aeroplane seemed to make a sudden steep climb and then landed with a bump. First the left wing hit the ground and then the aircraft crumpled up. I was not strapped in and so was fortunately thrown clear of the burning machine". How ever after this (the FIRST flight of a jet powered aeroplane) Henri Coanda could not find financial backing to progress with his invention. Gustava Eiffel remarked of Henri Coanda "This boy should have been born thirty years later"